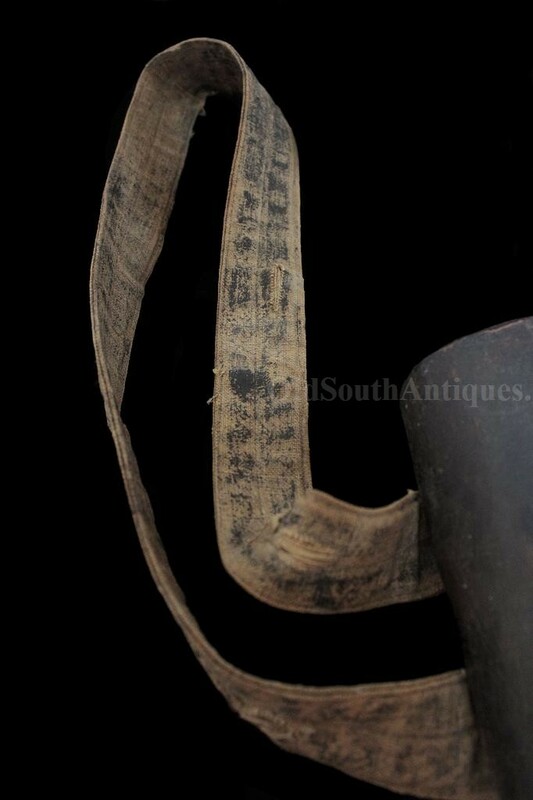 People that are unfamiliar with mid-nineteenth century military weaponry generally have the impression that soldiers carried a powder horn or some variation of one. In reality, soldiers were issued cartridges consisting of a paper tube, filled with a powder charge and ball. These paper cartridges were issued in paper packs of ten. Because they were made of paper, the cartridges were very fragile and even a slight wetting would ruin them; therefore, it was necessary that they be carried in a leather box which served to keep the cartridges dry. The box also served to keep out sparks during the heat of battle. Should a spark enter the box, the resulting explosion would severely injure or kill its owner. Basically, each soldier had a bomb strapped to his waist and only this box to keep it from igniting. 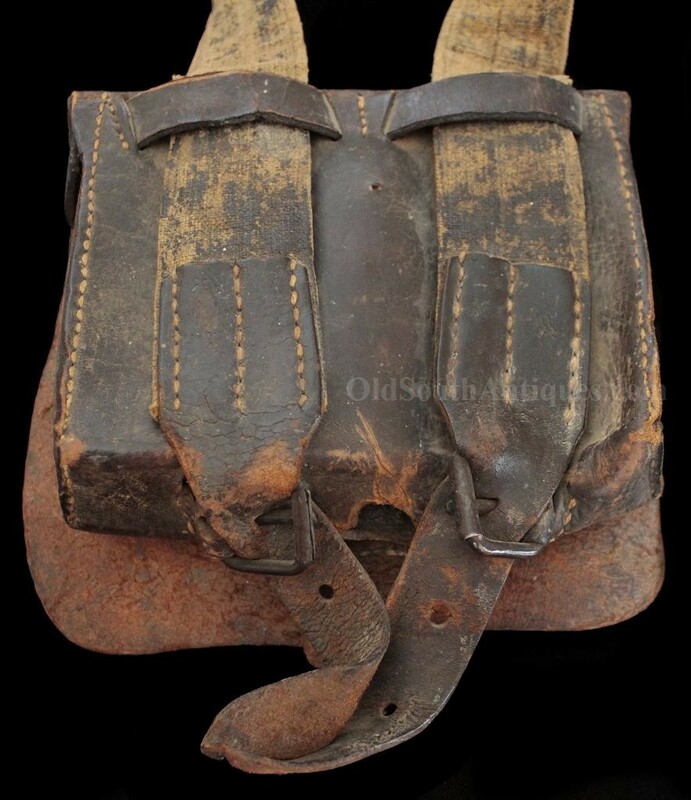 This cartridge box was used as a musket box (carried on a sling) rather than as a rifleman’s box (carried on the belt). The box is missing its closure finial; this was intentionally cut out. I expect this was done so that it could be used for a lead fishing sinker (this is of course speculation). This was probably cut out after the War. 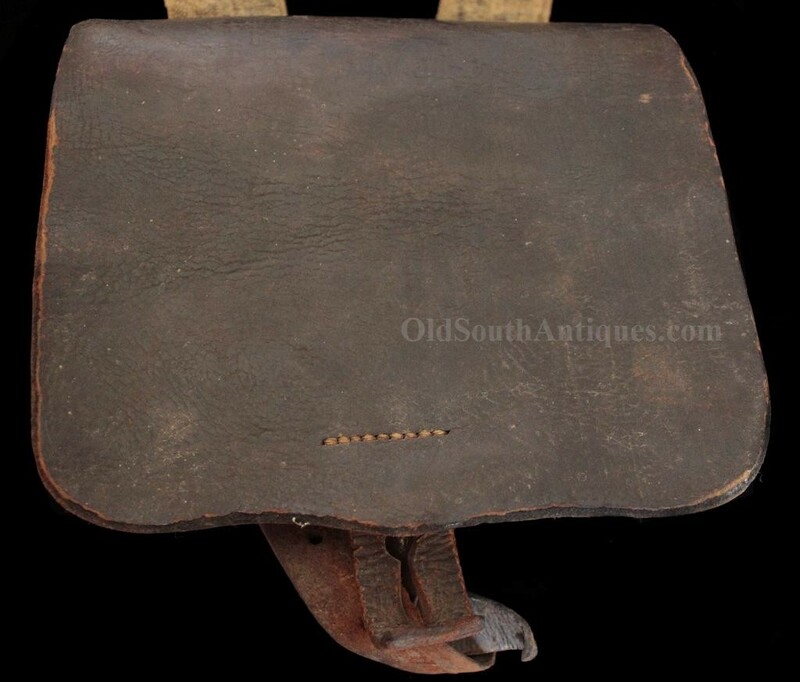 Though missing the finial and tin liner the box can still be identified as of Confederate manufacture by the russet tool pouch. 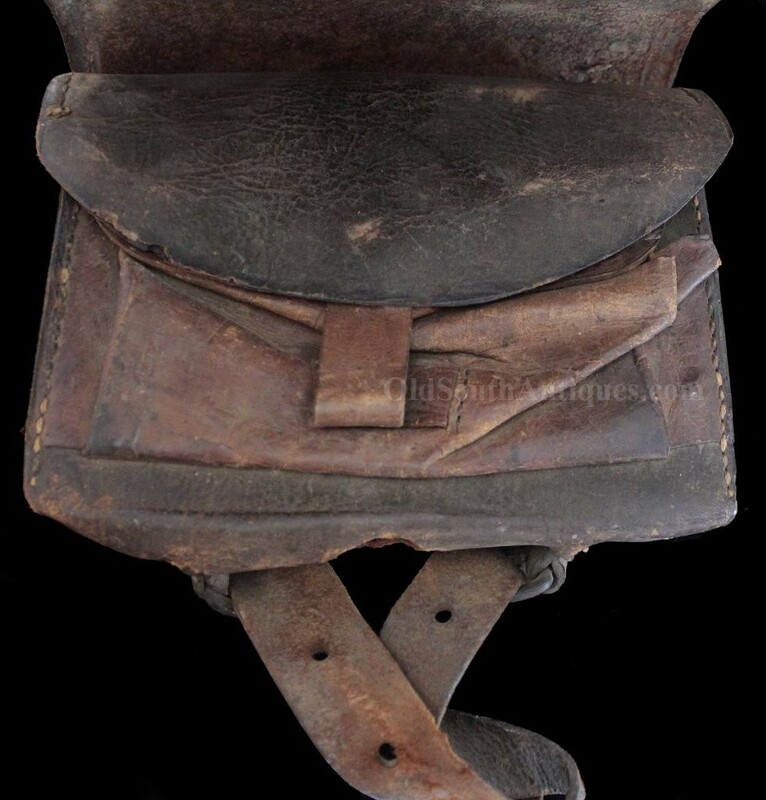 With the exception of the missing finial, the box is perfect, the outer latch tab is perfect, the tool pouch and inner latch tab are perfect, the end tabs are perfect, the inner flap is perfect, the buckles are perfect, and the leather is perfectly pliable. All of the stitching is strong and complete. But for the missing finial this box could not be improved upon. And it gets better! 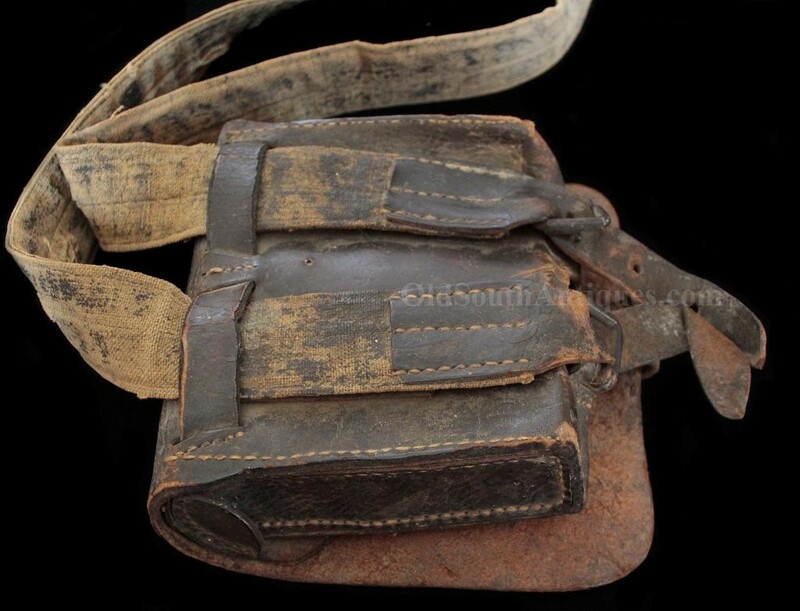 As hard as it is to find a perfect box, it is virtually impossible to get a perfect painted, canvas sling, they nearly all have broken or repaired leather rangers. But this sling is perfect! And it is without a doubt original to this box. 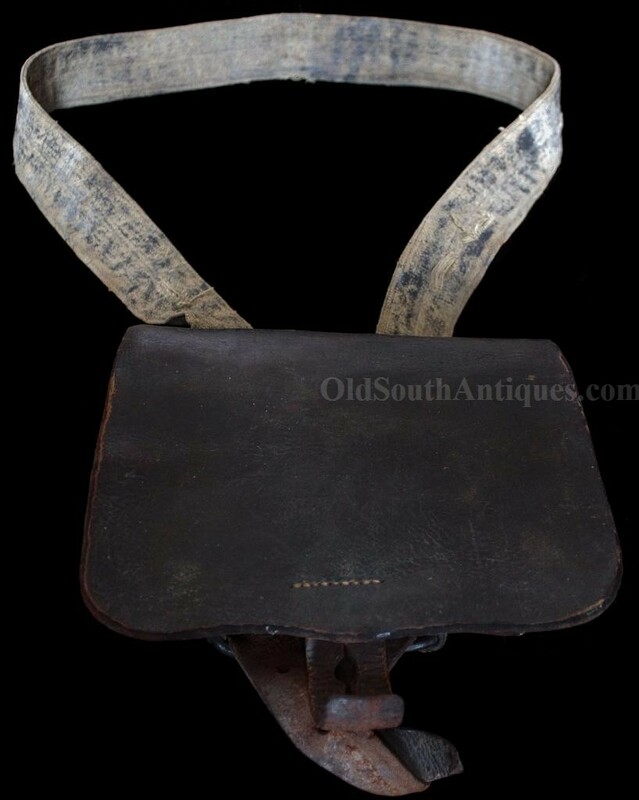 I have been collecting, buying and selling Confederate antiques for more than thirty years and this is only the third perfect box and sling combination I have ever encountered. 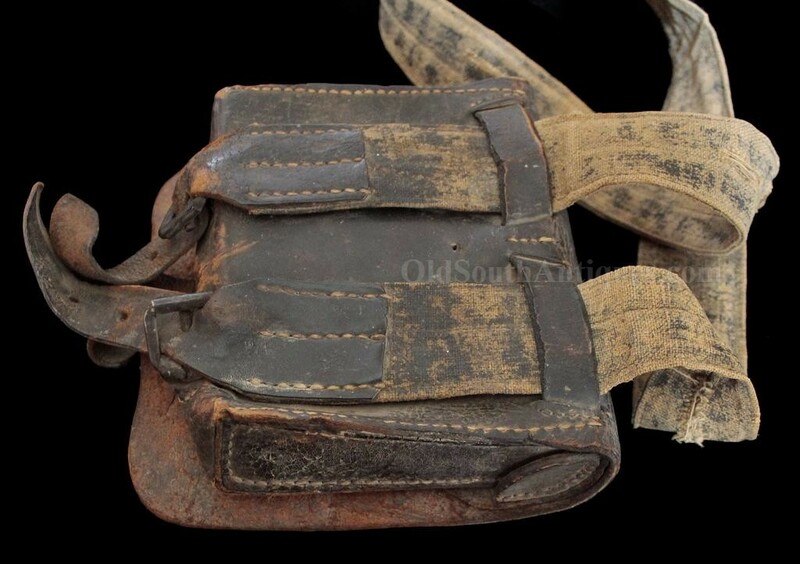 If a Confederate box with canvas sling is something you eventually want to add to your collection, you likely will never see a box and sling equal to this quality again in your lifetime. Not only is the sling strong and supple enough to hang on a mannequin, it is so strong you could, (not that you would want to) load it with 40 rounds and still hang in on your uniform mannequin! There is no weakness anywhere in the box or strap. It costs a premium to get the very best of collectibles, but they prove to be the best investments, and I have never yet heard anyone regret having bought the very best quality.